Sports Urban Legends Revealed! - For unbelievable true sports stories and believable false ones! 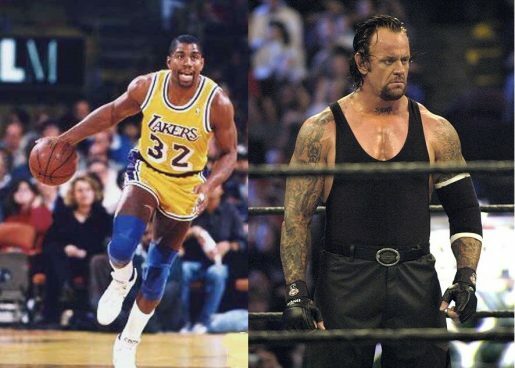 BASKETBALL URBAN LEGEND: Magic Johnson played high school basketball with WWE’s The Undertaker. A popular game to play with celebrities is to look at them “Before They Were Famous,” particularly when they were younger. It is especially fascinating when you discover that two different celebrities crossed paths when they were younger, like learning that Jon Hamm taught The Unbreakable Kimmy Schmidt’s Ellie Kemper acting in high school or that NFL superstar Randy Moss was high school football teammates with veteran NBA point guard Jason Williams. Thus, it comes as no surprise to find out that people were quite fascinated with a piece of trivia that has been making the rounds on the internet for the last few years (to the point where a number of readers have suggested it to me to use in this column) that Earvin “Magic” Johnson, legendary star of the Los Angeles Lakers played high school basketball with Mark “The Undertaker” Calaway, famed wrestling star of WWE. Is There a Golf Course In Hawaii That Exceeds The Maximum Difficulty Rating for Golf Courses? This is the latest in a series of examinations of urban legends related to golf and whether they are true or false. 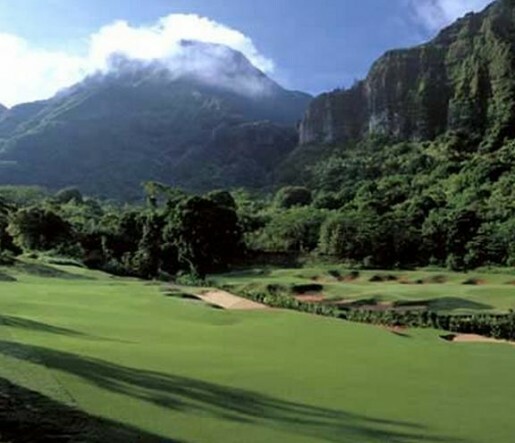 GOLF LEGEND: The course at Ko’olau Golf Club has a slope rating of 162 (where the maximum slope rating is 155). In what is likely the most famous scene in the classic 1984 comedy, This is Spinal Tap, the director of the “mockumentary” about a fictional rock band, Marty DiBergi (played by Rob Reiner, who did, indeed, direct the film), is given a tour of the stage equipment of Spinal Tap lead guitarist Nigel Tufnel (played by Christopher Guest). Tufnel is especially proud of his Marshall guitar amplifiers, whose volume level have eleven as the highest setting instead of ten (typically, amplifier sound levels are set as zero to ten), believing that his amplifiers having eleven as the highest level means that his amplifiers are louder than all others (“it’s one louder”). When DiBergi asks him, “Why don’t you just make ten louder and make ten be the top number and make that a little louder?” Tufnel has no idea what he is trying to get at, repeating again that these amps go up to eleven. I am reminded of this famous scene when the course at Hawaii’s famed (or perhaps infamous?) Ko’olau Golf Club is discussed. If you consult almost any guide to golf courses of the world, you will find a consistent description of this dramatic course. This is especially remarkable since the highest slope rating theoretically possible is 155. Were the Boston Braves Named After Members of the Boston Tea Party? BASEBALL URBAN LEGEND: The Boston Braves were named after the members of the Boston Tea Party. An interesting part of baseball history that is worth noting is how few of the current baseball team nicknames were used prior to the 20th Century. Don’t get me wrong, some teams certainly do have nicknames going as far back as the 19th Century, but most teams had informal nicknames that would often change seemingly at a whim. 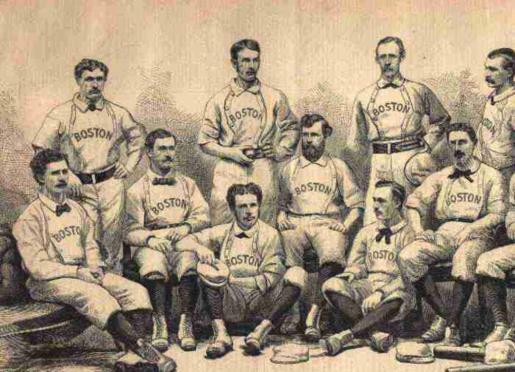 The first Boston baseball club is a good example of this, as they entered the National Association in 1871 known informally as the Boston Red Stockings (in honor of the first professional baseball team, the Cincinnati Red Stockings, who had dissolved following the 1870 season). In 1876, they joined the newly formed National League and since a new version of the Cincinnati Red Stockings were also in the league, the Boston team became known as the Red Caps (a lot of teams went by the colors of their uniforms). That name stuck for a few years before they began being referred to as the Boston Beaneaters from 1883 until 1906. During this time, the American League had debuted and they had a rival Boston baseball team, known as the Boston Americans. When the Beaneaters dropped red from their uniforms after the 1906 season, the rival Boston team quickly picked it up themselves and became known as the Red Sox. The newly red-less team now had all-white uniforms, and since their owner’s last name was Dovey, the press quickly dubbed them the Boston Doves in 1907. 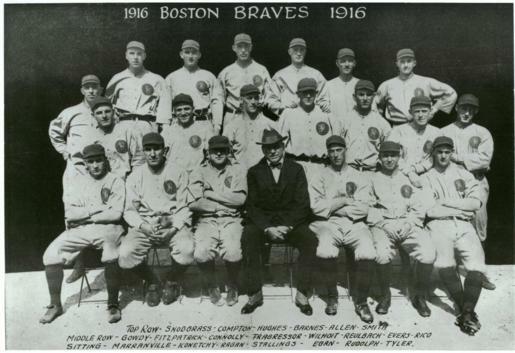 That name stuck for a few years before they tried the Boston Rustlers in 1911 and then, finally, the name that they would use for almost all of the next century (and still use today), the Boston Braves. But the origin of the Braves name is a confusing one, especially as the name carries with it controversy (along the lines of other teams named after Native Americans, like the Washington Redskins and the Cleveland Indians). Defenders of the Braves often point out that the name is actually derived from a significant event in United States history – the famed Boston Tea Party. Were the Chicago Blackhawks Once Forced to Pull a Local Goalie Out of a Bar to Start Game 1 of the Stanley Cup Finals? Here is the latest in a series of examinations into urban legends about hockey and whether they are true or false. Click here to view an archive of the hockey urban legends featured so far. HOCKEY URBAN LEGEND: Were the Chicago Blackhawks once forced to start a local goalie they found in a bar drinking on the day of Game 1 of the Stanley Cup Finals? You only have to go back to the 2002 World Series Champion Anaheim Angels to see an example of a player plucked from obscurity thrown into the spotlight in a championship season. Angels pitcher Francisco Rodriguez was a minor leaguer who only made the 2002 postseason roster due to a rash of injuries to the Angels bullpen late in the year – he went on to become a dominant part of the Angels championship team and after a few years of being their top setup man became their regular closer in 2005, eventually setting the record for most saves in a single season. So the hope is alive in many minor league players that all they need is the right break and they could get their moment in the sun. 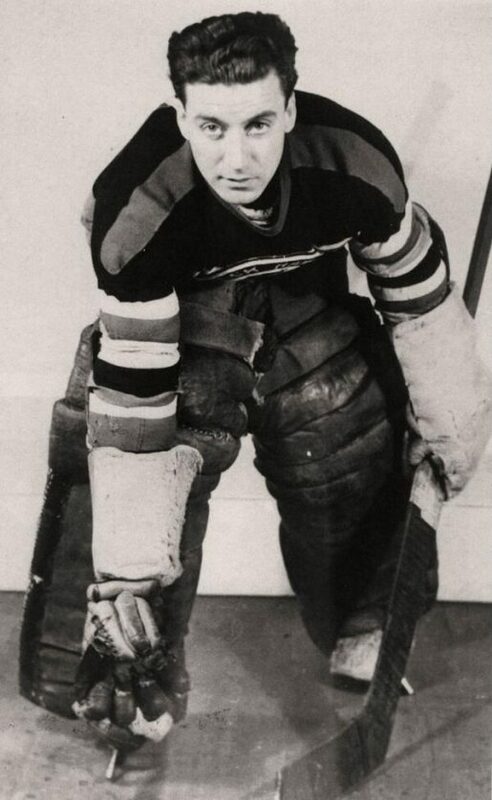 That moment came for Alfred “Alfie” Moore on April 5, 1938, a day that began as any other for the minor league goaltender (whose season had ended weeks ago) and ended with him winning Game 1 of the Stanley Cup Finals for the Chicago Blackhawks! However, Moore’s situation was a lot stranger than Rodriguez’s, including one of the more persistent myths in NHL history. Did Walter Johnson Pull Off a Feat That George Washington Only Did in Myths? 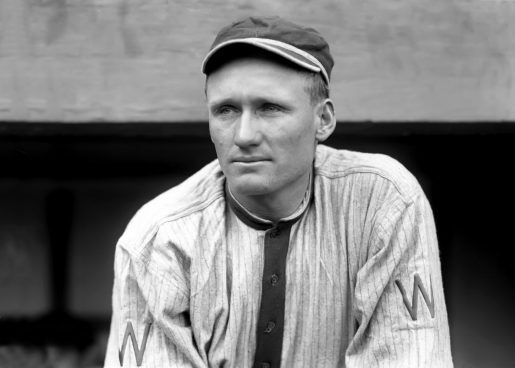 BASEBALL URBAN LEGEND: Walter Johnson reenacted a mythical George Washington coin toss. In John Ford’s classic 1962 western, The Man Who Shot Liberty Valance, there is a classic line after a newspaperman discovers the truth of who actually shot Liberty Valance. He is undeterred, though, noting “When the legend becomes fact, print the legend.” That’s exactly what United States history was for quite some time when partially fictionalized histories about famous people like Christopher Columbus and George Washington became accepted as fact by most Americans. In the case of Columbus, Washington Irving’s A History of the Life and Voyages of Christopher Columbus credited Columbus with proving that the Earth was not flat, a belief no one seriously still had in the late 15th Century. In the case of Washington, Parson Weems’ A History of the Life and Death, Virtues and Exploits of General George Washington invented what is perhaps the most famous George Washington anecdote, the tale of young George confessed to cutting down a cherry tree despite knowing that he would most likely be punished severely for his actions. However, Weems also invented a few other Washington anecdotes, including the time young George threw a silver dollar (since they didn’t actually have silver dollars, it “must” have been a piece of slate the size of a silver dollar) across the Rappahannock river. In 1936, Hall of Fame pitcher Walter “The Big Train” Johnson decided that he would do in real life what Washington only did in myth. Did the NBA Investigate Earl Monroe For Point Shaving After He Scored On His Own Basket? 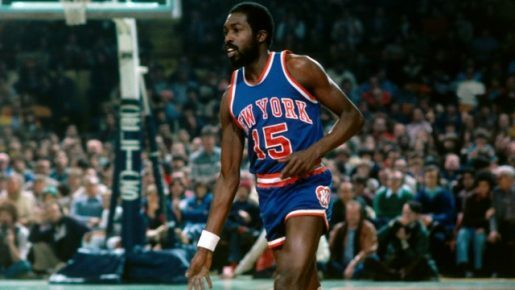 BASKETBALL URBAN LEGEND: Earl Monroe was investigated by the NBA for point-shaving due to Monroe making a shot on his own basket at the end of a game. Earl “the Pearl” Monroe has a bit of an odd position in New York Knicks history. He was brought to the Knicks in a blockbuster trade in 1971 and paired with Walt “Clyde” Frazier to form one of the most exciting backcourts in NBA history. Both players were great ballhandlers and scorers, so they gave opposing teams fits. They helped lead the Knicks to the 1973 NBA Championship. The “odd” position Monroe was in is that he was the last of the championship Knicks to leave the team. Well past the time that the Knicks were any good, Monroe was still on the team. He retired from the NBA as a member of the Knicks in 1980. It was kind of odd seeing these medicore-to-bad late 1970s Knicks team, but with Monroe still chugging along as a member of the team. Today’s legend involves a game a little bit earlier than that, during the Knicks’ mediocre 1976-77 season (when fellow future Hall of Famers Bill Bradley and Walt Frazier were also still on the team, as was Phil Jackson – Bradley retired after this season). After a March 1977 game against the Portland Trailblazers, Monroe was actually investigated by the NBA for point-shaving, all due to a bizarre shot that he made at the end of the game. Did an Olympic Fencer Cheat By Using a Rigged Epee? Here is the latest in a series of examinations into urban legends about the Olympics and Olympians and whether they are true or false. Click here to view an archive of the Olympic urban legends featured so far. OLYMPIC URBAN LEGEND: An Olympic athlete used a specially rigged epee to fake results during a pentathlon. Forgive me for a reference that is out of date (and only getting more and more out of date as every day passes), but today’s legend reminds me of the long-running crime series, Columbo. The series was set up so that the beginning of each episode would show us the criminals seemingly pull off a “perfect murder” and then the rest of the show would bring in the seemingly ineffectual Lt. Columbo, who would solve the murder while we see the murderer du jour (almost always a well known actor or actress) go from confident (and almost always looking down their noses at Columbo) to, well, arrested for murder with an airtight case against them. A good deal of the episodes involved the murderers putting together some sort of convoluted contraption that would help them achieve their crime and by the end of the episode, the contraption often ended up as part of the airtight proof against the murderer. As time went by, it amused me to see these murderers continue to think that they could cobble together something to rival James Bond’s famous gadgets (“It is a pen that is really a bomb!”) without it backfiring on them. Then again, in the case of one of the most shocking Olympic cheating scandals of all-time, that it just what one Olympian tried to do – use a contraption to get away with the “perfect crime.” Only just like Robert Culp, Jack Cassidy and their ilk on Columbo, it backfired spectacularly. Did the Original Winner of the 1904 Olympic Marathon Get a Ride in a Car During the Race? OLYMPIC URBAN LEGEND: Of the first two finishers of the 1904 Olympic Marathon, one nearly died due to taking drugs designed to help him win the competition – and that’s the one who DIDN’T get disqualified. 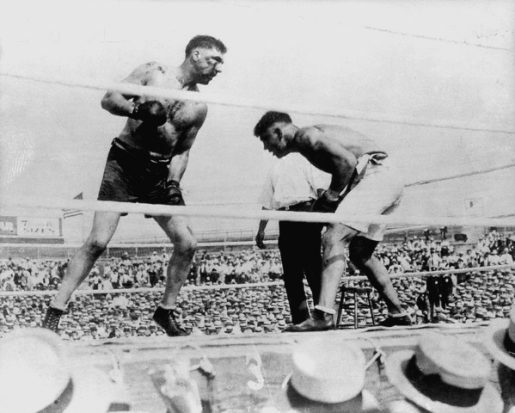 In a sports world that has seen one Olympic skater attempt to have another skater (from her own country) crippled before the Olympics and seen countless star athletes revealed to have used some form of performance-enhancing drugs (like steroids), I suppose the events of the 1904 Olympic Marathon would not be that surprising. However, the sheer amount of scandal packed into one race is still quite notable, and one can only imagine the attention such a race would have received in the modern age of the 24 hour news cycle. Of the first two men to cross the finish line in the 1904 Marathon, Thomas Hicks nearly died from using his era’s equivalent of “performance-enhancing drugs,” and he was the one who WASN’T disqualified. Fred Lorz’s journey to the finish line was even stranger than that, as it involved getting a ride in a car! Were a Group of Ukrainian Prisoners Killed After Defeating Their Nazi Captors in a Game of Soccer? Here is the latest in a series of examinations into urban legends about soccer/football and whether they are true or false. Click here to view an archive of the soccer/football urban legends featured so far. SOCCER/FOOTBALL URBAN LEGEND: A group of Ukrainian athletes/prisoners of war were executed after they defeated their Nazi jailers in a game of football/soccer. It is now nearly eighty years since the start of the Second World War, but stories of the atrocities committed by the Nazis during the war still resonate to this day. In the case of Kiev (in their language, Kyiv), the capital of Ukraine, the population was decimated during the war from 400,000 people to less than 100,000. While it might not have been specifically stated at any point, it appears evident that the Nazis’ plan was to cull the population of Ukraine to make room for eventual German colonization. In such a terrible environment, the citizens tended to take their victories wherever they could, and in the case of the people of Kiev, their method of fighting back came in the form of football/soccer. However, like any other victory during war, their actions came with great risks. Today we shall take a look at the bravery of Start, City of Kiev All-Stars, and the awful price they paid for their bravery.